The Trevi Fountain (in Italian: Fontana di Trevi) is a famous landmark in Rome, built in 1762. It is said to ensure anyone who throws coins into the fountain a return to the city. 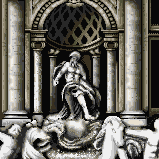 The Trevi Fountain appears in Mario is Missing! as one of the landmarks that are attacked by Koopa Troopas and that Luigi subsequently visits in Rome. It is closed because the Koopa Troopas stole the fountain's Coins, and it cannot reopen until Luigi returns them. After bringing them to the information booth and proving their authenticity (done by answering various questions, listed below), he is given $1500 as a reward. The Trevi is the biggest and oldest _____ in Rome? Add your two cents, Luigi. Why do people throw coins? Why is the Trevi famous? When was the Trevi built?